PHOTO: Allen Ramsey, DWCPhoto.com. Highlands senior defensive lineman Tyler Sexton (80) tracks down Boone County running back Amadou Diaw (5) in Friday's game in Florence. Highlands won 32-6. 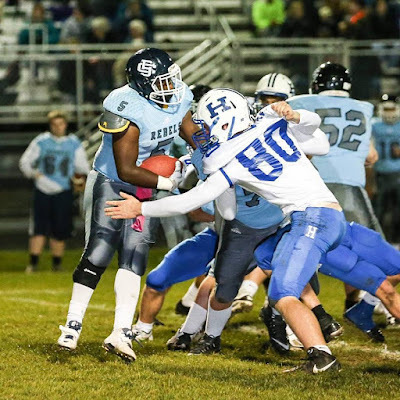 FLORENCE - It is easy for winless teams to give up at this time of the year.But the host Boone County Rebels did anything but that here Friday. Seeking just its third win since 2011, the Rebels battled the Bluebirds into the second half before Highlands pulled away for a 32-6 non-district victory to conclude the regular season. Highlands has won four straight to move to 5-5 on the season and Boone County (0-10) concluded its second winless regular season in four years dropping its 19th straight dating back to a 49-26 win over Conner on Aug. 29, 2014. The Rebels are 2-41 since winning a Class 6A region crown in 2011. "We made plays when we had to," said Brian Weinrich, Highlands Head Coach. "(The grass field) had nothing to do with it on either side of the ball. I didn't see anyone on either team slip. On film, (the Rebels) execute. They have a hard time finishing drives for whatever reason offensively. But they play hard. They're very sound. You have to earn everything against them." The difference in the game came on third and fourth-down conversions. Highlands converted 50 percent on both third (6-of-12) and fourth down (2-of-4) compared to 32 percent (6-of-19) on third down and 40 percent (2-of-5) on fourth down for Boone County. Highlands outgained Boone County, 312-255 in total offense with 13 first downs compared to 11 for the Rebels. But the Bluebirds had to pull away with the passing game as the Rebels crept most of their defenders near the line of scrimmage to take away the sweeps and off-tackle running plays Highlands ran with a lot of success against Grant County a week ago. But the Highlands offense answered the call. Bluebird senior quarterback Austin Hergott completed 14-of-23 passes for 210 yards, three touchdowns and an interception. Several underclassmen wide receivers stepped forward and had big nights for the Bluebirds. Sophomore Griffin Huber had three catches for 57 yards and junior Trent Buchert had three for 54 yards and a touchdown with sophomore Nick Veneman recording two catches and a touchdown. Highlands managed 102 yards rushing the ball. Senior Nick Kendall again led the Bluebirds with 73 yards rushing on 13 carries and a touchdown. Boone County kept the game close lining up mostly in the Power-I set offensively and pounding the ball between the tackles mostly with senior Amadou Diaw. Diaw finished with 89 yards rushing on 24 carries and Corstin Cahill had 17 carries for 65 yards. "We did a lot of pinches to try to stop the inside run," said Tyler Sexton, Highlands senior defensive lineman. "We tried to do a lot of Steeler (strategy) in which one end gets the B Gap and the other gets the C. We tried to get some penetration and hoped to tackle him there. Outside the tackle is the C gap and inside the tackle is B gap." Highlands did not have the services of its best defensive lineman in senior Tyler Robinson. He had 8.5 tackles for a loss and four quarterback sacks on the season. "They did like we expected," said Shelby Jones, Highlands Defensive Coordinator. "We didn't come out and execute like I expected to. With (Robinson) being out, that hurts size-wise. We'll continue to get better. We made some good plays in the second half. (Diaw) was gaining extra yards after some contact. That was the big difference early on. Once we got a hold on field position, we were fine. Whenever they have to go only a few yards, that gives them the advantage a bit." The Rebels did not do much through the air once Highlands built a comfortable lead. Rebel quarterback Peter Westhoff completed 7-of-15 passes for 84 yards and an interception. Highlands won the opening coin toss and deferred to Boone County. The Rebels decided to receive the ball first, but they fumbled the ball at their own 16-yard-line and Highlands junior Sam Taylor recovered it. The Bluebirds scored just 31 seconds later. Kendall took it in from two yards out and Jared Dougherty made the first of three extra-point kicks to give Highlands a 7-0 lead. After a Boone County three-and-out, Highlands junior Bradley Greene returned the kick to the Rebel 11. The Bluebirds tried for a quick score but Rebel junior defensive back Devin Ruberg intercepted Hergott's pass in the end zone ending the threat. The Rebels had to punt once again after recording a first down. They received the ball at the Highlands 32 when the punt hit a Highlands receiver. But Boone County could not move the ball as Luke Lindeman recorded a crucial sack of Westhoff on the drive. After a few possessions, Boone County took the ball at its own 43 with 7:18 left in the half. The Rebels drove down and scored with 4:09 left in the half when Diaw scored from three yards out. But the PAT bounced off the right pole leaving the score 7-6 in favor of Highlands. Boone County recovered a Highlands fumble 17 seconds later at the Bluebird 40. But on 4th-and-1 at the Highlands 31, Bluebird linebacker Ben Ziegler stopped Diaw for no gain. The Bluebirds capitalized on the momentum with 2:24 left in the half. Hergott completed a long pass to TJ Sipple to the Rebel 32. The Bluebirds then came through on 4th-and-15 when Hergott completed a 37-yard touchdown pass to Buchert. Dougherty's extra-point kick gave Highalnds a 14-6 lead at halftime. "It felt really good," Buchert said. "I think it came at a really big time in the game. I'm just glad I can contribute the team like that. We have enough confidence that we can take most (defensive backs) one-on-one so we really like that match-up. We knew it was going to be there sooner or later." Highlands received the ball to open the second half. The Bluebirds drove deep into Boone County territory before settling for a Dougherty 32-yard field goal with 9:21 left in the third quarter. That put Highlands up 17-6. "They were playing great defense in the first half," Weinrich said. "They were putting us in some holes we couldn't get out of. We just had to maintain some drives, keep out defense off the field and force them to get out of their power running game." The Bluebirds drove to the Rebel 7 on their next possession. After Grant Murray ran for three yards, Highlands lost seven yards when Hergott had to land on a bad snap at the Rebel 11. However, on 3rd-and-goal, Highlands came through again. Hergott rolled right and Kendall snuck out into the left flat. Kendall caught the screen pass and scored from 11 yards out to put Highlands up 24-6 with 3:05 left in the third quarter. Highlands came up with two crucial stops on fourth down defensively in the fourth quarter. Trey Bowden and Lindeman stopped Diaw at the Highlands 31 with 9:17 left in the game on 4th-and-1. The Bluebirds also held on 4th-and-5 on an incomplete pass at their own 19 with 4:37 left in the game. The Bluebirds put together a nice drive for their final score after that. It started with Hergott completing a nice pass to Huber. It concluded with 2:56 left in the game when Hergott completed a 24-yard touchdown pass on a go route to Veneman. Mitch Cain ran near the right pylon for the two-point conversion to make the final score of 32-6. "We take it week-by-week," Weinrich said. "We're going to take what's there, evaluate our guys on film, evaluate our plays and see what's working. We have a long way to go." Highlands opens the Class 5A playoffs on Friday at 7:30 p.m. The opponent is the Woodford County Yellow Jackets (3-7) from west of Lexington.